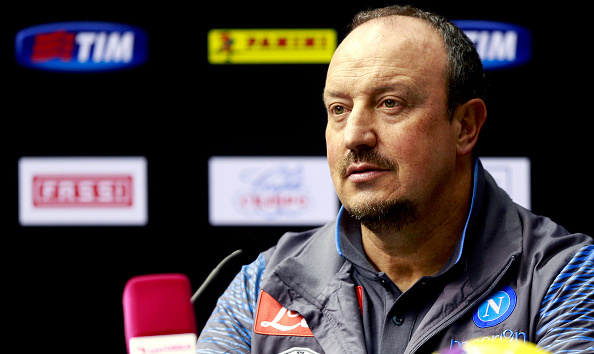 Napoli coach Rafael Benitez shrugged off talk about his team’s January transfer targets, instead making it clear that the Partenopei are only thinking about Monday’s Supercoppa Italiana clash against Juventus in Doha. In a press conference at the Al-Sadd Stadium on Sunday night, Benitez was asked by Sportskeeda to comment on transfer rumours revolving around a Mario Balotelli loan deal to Napoli. It was a question which elicited quite a few chuckles in the hall, including from Napoli’s eccentric President and film producer Aurelio De Laurentiis. Serie A defending champions Juventus and Coppa Italia holders Napoli will square off on Monday night for the Supercoppa Italiana at 17:30 GMT (23:00 IST).